The past week has been historic– the United States legalised gay marriage, leading to a slew of celebration and parades in the country. Numerous people not living in the USA too have taken to appreciate the country. In India, most of us changed our Facebook pictures, hopefully as a reminder for the long way we have to go to ensure LGBT rights. A symbol of the Pride movement is the rainbow– my point of inspiration for today’s post. Before there are any misunderstandings, I would like to say that this post in no way dilutes the legitimacy of the rainbow symbol, and all that it stands for. LGBT rights are a step forward for humanity and acceptance, and a deeply personal movement for so many people. I am in full support of equal rights for the LGBT community. And I am inspired by the colours of the rainbow- how it is a way of expression, and a sign of a powerful movement. I personally believe that wearing a rainbow (literally, figuratively, or on Facebook) is a way to celebrate both this momentous occasion, and the joys of colours. Today, I’m going to give you ways to wear a rainbow in your outfits. Whether you incorporate the entire VIBGYOR or choose to block your colours, there is a rainbow out there for everyone. So here are my ways to wear a rainbow. Plus, my favourite multi coloured pieces to buy are at the end of the post, so scroll away! Multiple rainbows require careful coordination, but this street style snap makes it look impossibly easy. Plus, those Valentino rockstud shoes + bag are designed for success. Let’s ease into the rainbow, shall we? A multicoloured piece is bold, so let it be the centre of the attention. By pairing it with classic black and white pieces, you won’t take away the brightness of the skirt. Plus, it makes the piece so much more versatile when you can wear it with clothes you most probably already own! In all three examples above, the skirt is the focus of the outfit, and all the pieces only supplement the colours. Print mixing 101: The best way to wear a print is with a solid colour that also features in the print. This tip makes wearing multicoloured pieces so easy. In these three outfits, the printed scarf is complemented by the mustard skirt. The bright, striped skirt takes the red up a notch by wearing it with a matching sweater. And the accessories are in colours that feature in the skirt, red and white. These are the easiest ways to wear more colour, if you’re a person who wants to experiment. Colour blocking is a trend that never really died, because of its ability to make one look impossibly fashionable. After all, it takes a good eye to mix solid coloured pieces (especially brights) without going over the top/visual hazard. An easy way to colour block is to mix neutrals with your bold colours. Heather grey breaks up the orange and blue, while the brown adds an earthy feel to the blue & purple combination. If you want to go all out, chartreuse (bright green) + royal blue + leopard print is the way to go. I have loved this combination since I set eyes on it, and cannot wait to try it out myself. It is so chic. If the idea of wearing bright blue and red together unnerve you, pastels are a good way to achieve the multi colour effect without bright colours. There’s a subtlety with pastels that makes them more of a summer colour choice, but sometimes pairing pastels is tricky. Pista green + pastel pink + white (the neutral that breaks them up) is a combination that sounds less than optimal on paper, but works wonderfully on outfits. And chambray (lighter, denim-like cotton, and material to numerous button downs) would pair well with all pastels, especially pinks. And when in doubt, white jeans will always come to your rescue. Our culture is an explosion of colour, and our clothing is no different. Every inch of our country celebrates vividly, and there is no better way to channel the rainbow than looking to our own. The sari is a thing of beauty, and whether you go Kanjivaram or Kota silk, the bright weaves and colour combinations make it impossible to go wrong! Where else can you find bright orange, royal blue, and jade green coexist without chaos? Or print on print on print on Tusser silk, in a variety of colours? This is the easiest way for us to go bright without worry. Shop my favourite rainbow picks below! Haute Curry at Shoppers Stop always has the cutest stuff! I love this printed skirt. It’s wearable, and bright. Buy it here. Quirk Box, the brand known for its minion (not the Despicable Me kind) print has a new line, Quirk Box Gold, made of premium fabrics, and carrying a rainbow world monuments print. This skirt was my favourite of the lot (give me a flare and a rainbow and I will be happy), but the price is a little premium. Buy it here. Good old AND by Anita Dongre also has fun prints in a variety of colours. 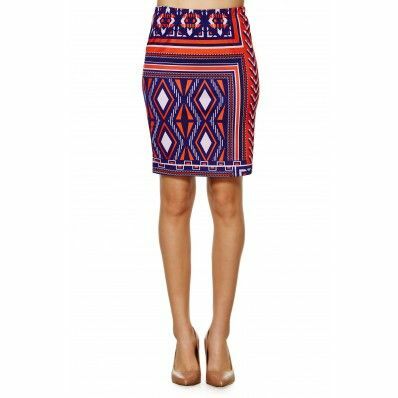 This skirt would look great with a white 3/4th sleeve tee & orange shoes. Buy here. This t-shirt from Zara is begging to be worn with mustard pants. 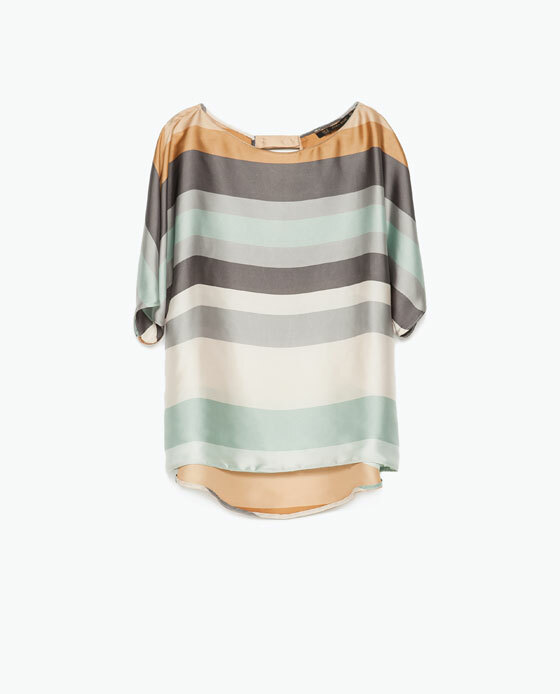 Again Zara, a muted set of stripes that make multicolours work for every day. This blouse would also work for formal occasions. 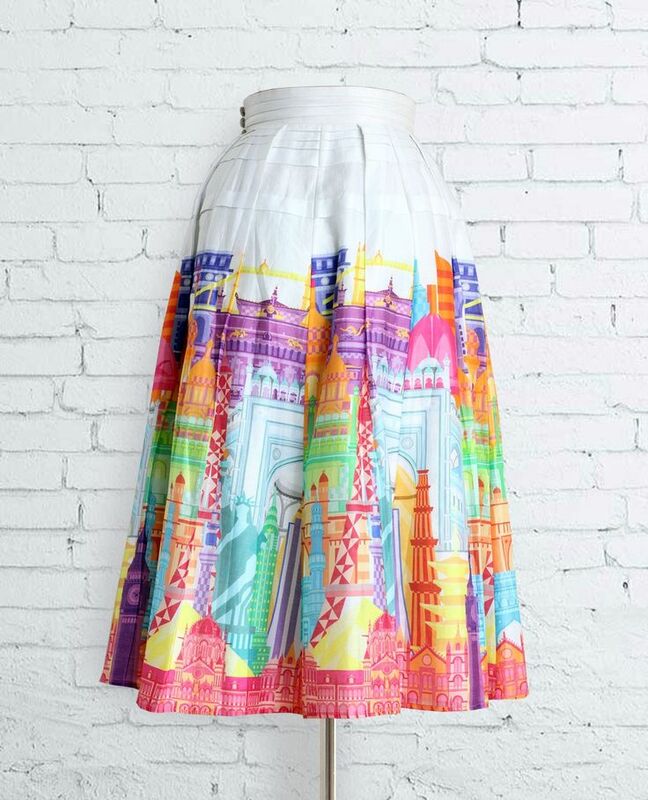 Printed pencil skirts totally count as a rainbow addition. 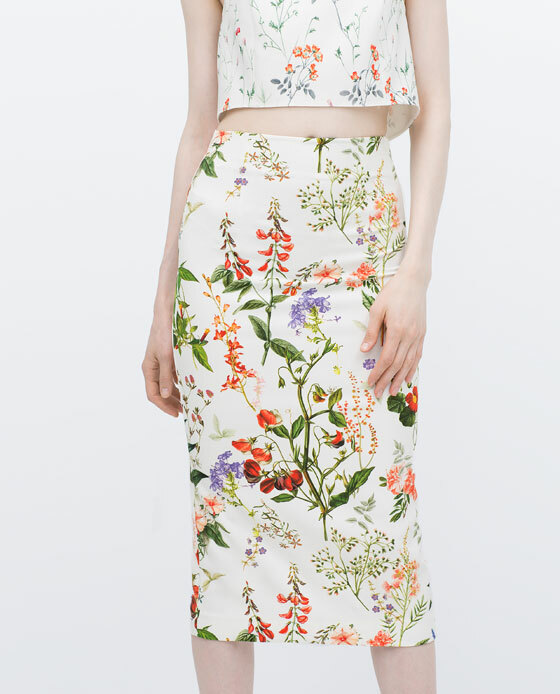 This Zara skirt embodies summer, and can be worn in so many ways. 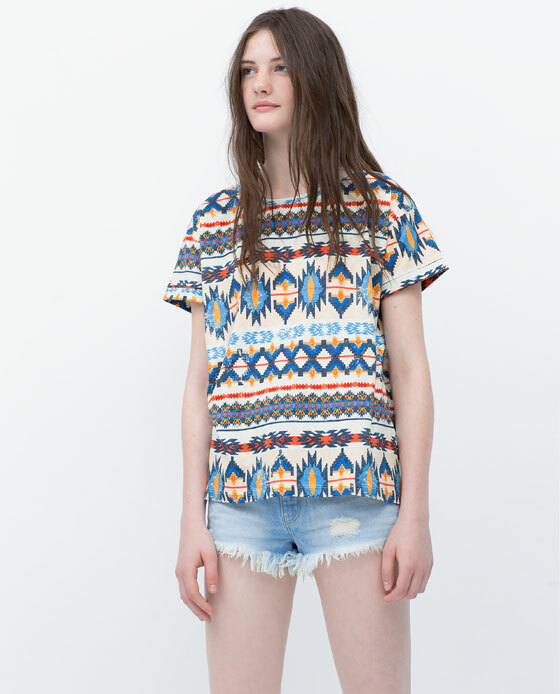 Preeti S Kapoor’s collection on Jabong has a range of brightly coloured tops, that are Indian yet Western. Shop the blouse here. I’m actually really into the vest-over-kurta trend that a lot of Indian wear brands are showcasing. 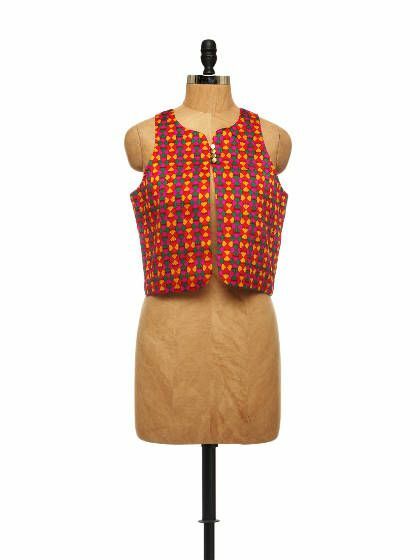 A rainbow print vest like this takes your college outfit up a notch, without the heat of an extra layer. This piece would look fantastic with a white kurti and a red patiala. Buy it here. THIS is the sari I have been waiting for. 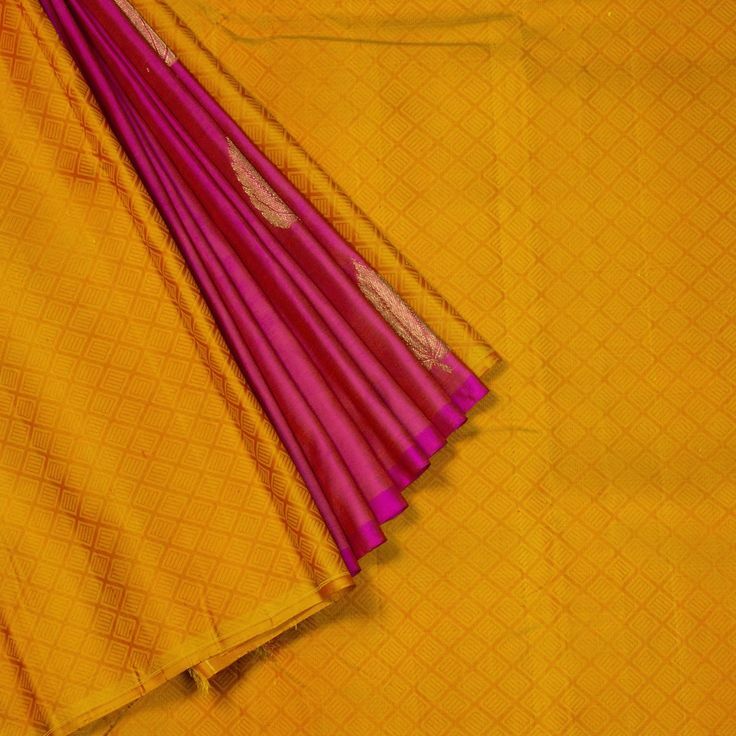 Mango yellow and Rani pink are a match made in Kanjivaram heaven. 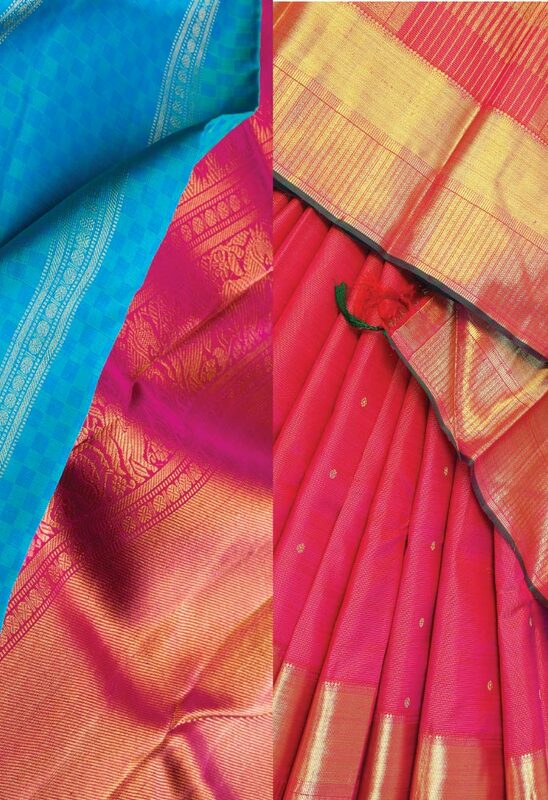 The Kanakavalli brand is known for its curated, covet-worthy saris. I’m going to ask my mother to buy me this. At 14k, it’s a pretty penny, but I would say its worth the investment. 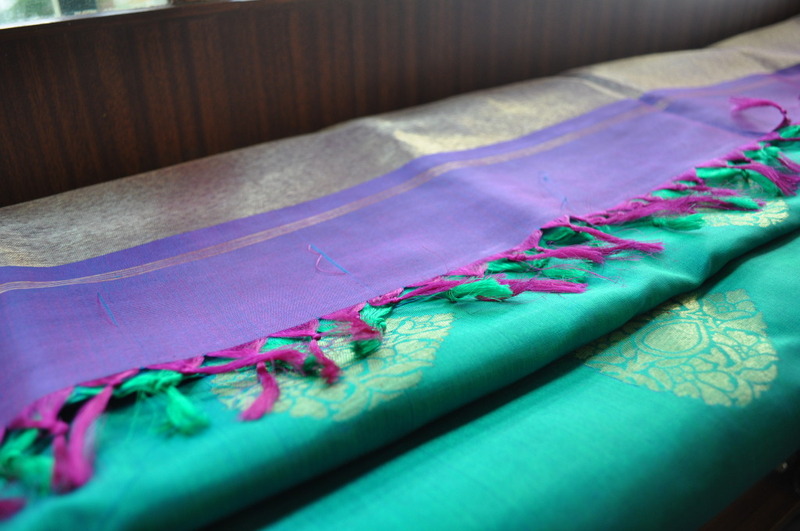 If you have been waiting for a Kanjivaram buy, you can go ahead with this sari here. 500 likes + a giveaway!